NetSupport Manager gives you easy remote control access, plus a few other bells and whistles. There is certainly no shortage of remote control software on the market today. So when I first started looking at the new version of NetSupport Manager (NSM), I couldn't help but think, “Not another remote control application. They're all the same.” After using NSM, though, I've changed my mind. It does a lot more than just simple remote control. During the installation process, NSM lets you easily push the remote control client out to workstations over the network. Once the client is installed, you'll be able to view and manage remote machines from the NetSupport Control application (see Figure 1). I tested all of these remote control functions and they worked flawlessly on both Windows XP Professional and Windows Server 2003 clients. Select an option from the list to effect that action on the remote machine. Most of the options such as Power On, Power Off, Reboot and Logout are self-explanatory, but several others go beyond basic control functions. I really like the Remote Command Prompt and File Transfer Features. With one click, you have access to the command prompt on the remote machine. Most of the time, I could do everything I needed from the command line without ever having to actually take over the remote desktop. This saves time and maintains productivity because you don't have to interrupt the user to work on their machine. The File Transfer feature lets you copy files to and from the machine. 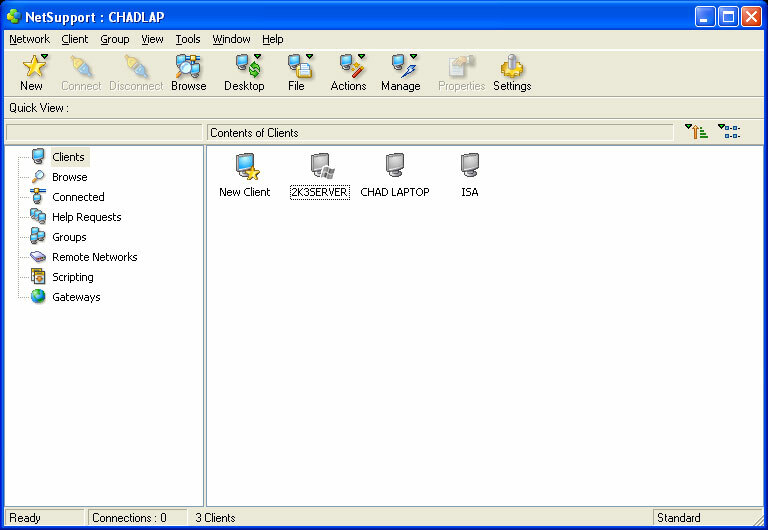 There's also a synchronization feature that lets you sync up a remote directory with a local one. The viewing options let you see what's happening on the remote client's desktop and control the system. Remote viewing functions very smoothly. I didn't notice any screen delay at all when controlling remote machines. Once you're connected, you can easily switch between Share, Watch and Control modes. Share mode lets both you and the remote user control the desktop. This can get a bit confusing, so you might want to alert the user before selecting this mode. In Watch mode, the user controls his or her desktop. You're just looking in on what they're doing. Control mode breaks in and lets you control the desktop. There's also a feature in NSM that lets you blank out the remote user's screen. I can see this being useful when you're controlling servers remotely. You may not want someone at the remote user's workstation watching what you're doing. From the View window, you can also send a message to the remote user. You can even control how long the message stays on the screen. If you want the client to be able to respond, you can initiate a text or audio chat session. 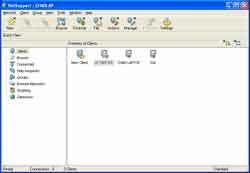 NSM provides a gateway feature for connecting to machines separated by different firewalls. Let's say, for example, that you're at home on the weekend and you get a call from one of your users, reporting that he's having a problem with his laptop at home. You could walk him through the problem over the phone or connect to his machine via a VPN. With NSM, he connects his client to the HTTP gateway over the Internet. You can then do the same with the control client on your laptop. Now you can view his system just as if you were on his home network. NSM has some other features that are worth mentioning. Scanning cycles you through each connected client, which is handy if you need to check in on all the systems for which you have responsibility. You can choose how long each client is displayed before going to the next. This is great for setting up a monitoring machine to display the desktops of your mission-critical servers. There's also an inventory collection agent that collects data on more than 50 different hardware and software values. Exhibiting lets you show a client's desktop to other clients. This is perfect for classroom environments when a particular student is doing something that everyone needs to see. You can also record a client's activity and then play it back to other clients. NSM also has a scripting and scheduling component that lets you write a script to automate repetitive tasks on remote clients. NSM was easy to deploy. Its interface is intuitive—I was able to use the software by just clicking around the control window. Everything is clearly labeled and easy to find. Most importantly, it worked right out of the box without any problems. NetSupport even provides a 331-page manual that walks you through every possible task within NSM in great detail. NSM is feature-rich and easy to use. I would highly recommend it if you're looking for a comprehensive and capable remote management solution.